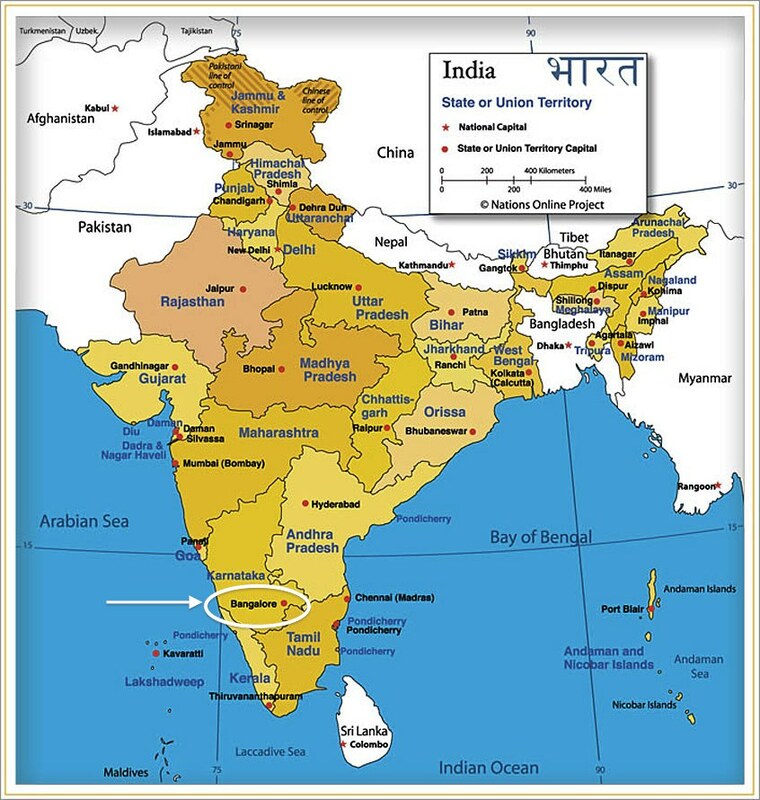 A pale blue sky above orange soil, purple wisteria and white frangipani moving gently in the hot, dry breeze, the winery bustling with stacks of bright blue crates dotted with orange, yellow and red ones against which are set the brightly coloured saris of women sat at a sorting table – deep yellow, orange, green and burgundy threaded with brilliant gold. That is how I would describe our visit to Grover Vineyards – the juxtaposition of the familiar with the unfamiliar – the familiar colours of India with the unfamiliar sights and sounds of a vineyard in India. Grover Vineyards is a family business borne of a passion for French wine and a sense of innovation by founder Kunwal Grover. Relationships with key French wine professionals such as George Vesselle then of Champagne Mumm, renowned oenologist Michel Rolland and winemaker since 2007, Thibault Verdenal from the Loire Valley have all informed the style of winemaking at Grover Vineyards. In the early 1980’s a trial of 33 French grape varieties began in a bid to identify the best sites and varieties suited to India. Cooler climate varieties, Pinot Noir and Chardonnay, were the first two deemed unsuitable and were subsequently removed from the trial. 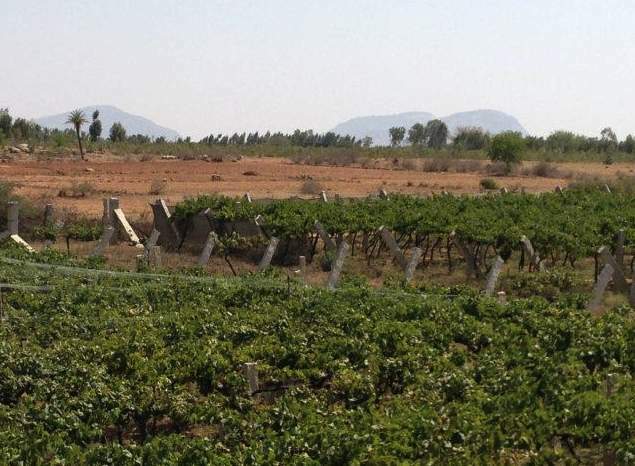 After five years of searching, the Nandi Hills region approximately 40 kms north of Bangalore and five grape varieties were selected. 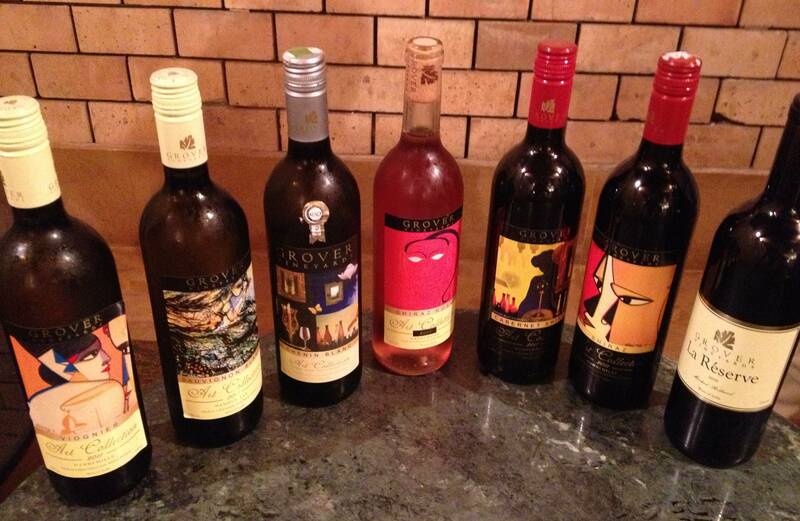 In 1988 Grover Vineyards was officially founded. 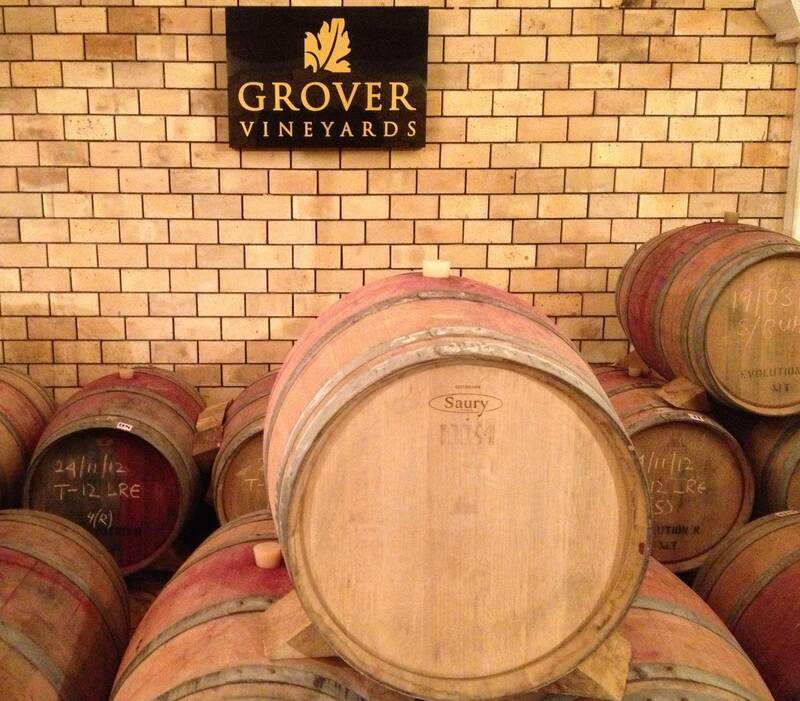 The first vintage to be released was in 1992 and Grover Vineyards continue to produce wines from the successful five varieties – Syrah, Cabernet Sauvignon, Sauvignon Blanc, Chenin Blanc and Viognier. Exports to Europe and most recently China currently account for 20% of production whilst the remaining 80% is for the domestic market. Trials still continue at Grover and include Grenache, Merlot and Zinfandel – all in extremely small quantities. When Grover Vineyards was first established there was no skilled labour for the specific tasks of a vineyard and significant investment in the community was required. Local sugar cane farmers and other producers were brought in and trained in vineyard trellising, harvesting and so forth. As a result Grover has a workforce of approximately 150 employees some of whom have 15-20 years experience with the vineyard. Our visit started with a short drive to the vines, which are currently a mixture of the traditional pergola and the more modern cordon vine training systems. 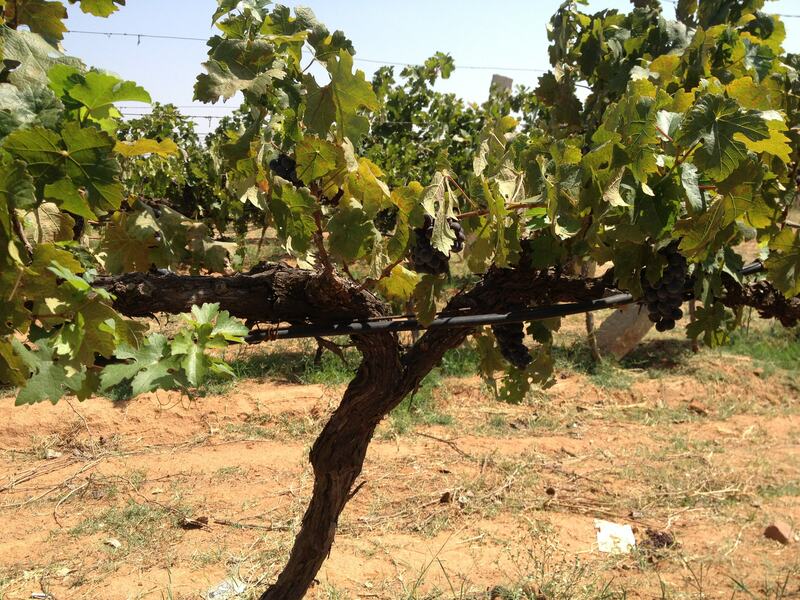 Our guide, Jay Kumar, confirmed the vineyard was moving to use the cordon system for all vines, as it would provide better aeration and more even exposure to sunlight. This would also reduce the risk of fungal disease and rot associated with a higher humidity under the pergola canopy as well as allowing more even ripening of the grapes within each bunch. Syrah grapes on the pergola training system showing uneven ripening. The cordon system is a method that trains the cordons, or arms of the vine trunk, to grow horizontally along the trellis wire. A single arm in an inverted L shape, as is common in the Champagne region may be used, or two arms as is shown below at Grover Vineyards may be used. 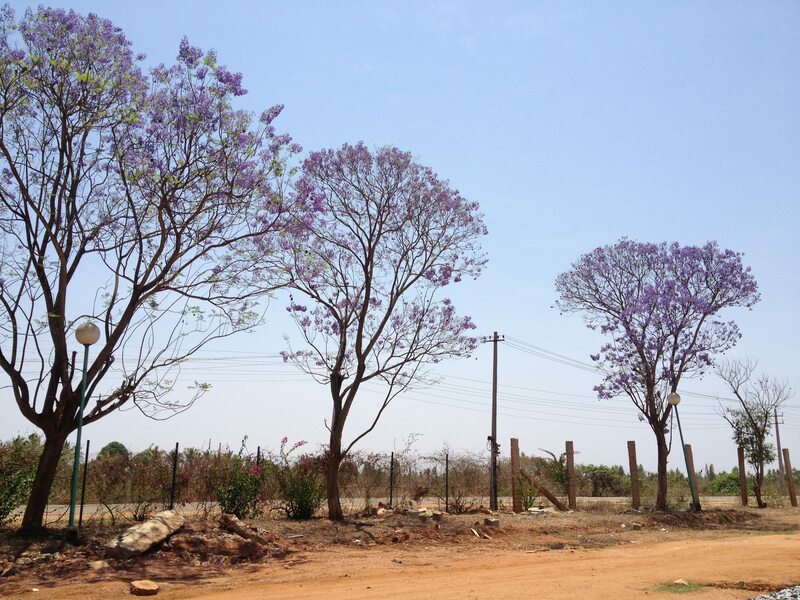 – Scheduling pruning around monsoon season. Ideally pruning occurs in the months of July – August and then again in October – November but must ultimately be scheduled around the monsoons. – Pest management which includes the usual suspects, birds, but also extends to termites and monkeys. Termites do not usually threaten young vines but as the vine ages and the trunk becomes more woody termites become a serious risk and monkeys, with their inquisitive nature and dexterity, prove to be a significant challenge – the sound of air guns is used to scare them from the vineyard. After the vines we headed back to the winery where photography was not permitted until we reached the barrel room for the tasting – hence my humble attempt at the beginning of this article to describe what we saw! We were taken through some of the steps of wine making including sorting the grapes to remove unripe or damaged grapes, destemming the bunches and pumping the grapes into large stainless steel tanks for fermentation to begin. Although new French oak is used for the La Reserve wine all other wines are fermented in stainless steel, no doubt in part to manage the high costs of purchasing new barrels (approx. €1,000 per barrel) which are only used twice (!) at this winery before being decommissioned. In the barrel room we tasted four wines from the Art Collection and the La Reserve from 2010. Our tour finished with a simple but tasty lunch outside the winery. I enjoyed our visit immensely and saw many examples of careful winemaking that made full use of modern technology in order to produce wines that are very approachable for a domestic market relatively new to wine. 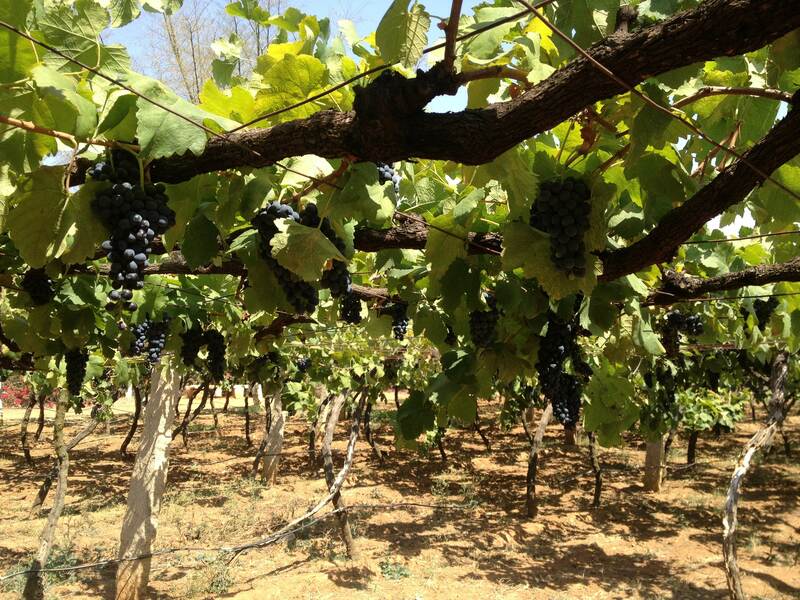 It will be exciting to see both Grover Vineyards and the domestic market continue to grow and experiment with producing wines that display characteristics unique to this region of India. I found writing tasting notes for the white and rosé wines a little challenging as they were served immediately from a wine fridge set at 5 degrees Celsius. I am certain I would have been able to write more extensive descriptions has the wines not be so cold. Pale lemon colour. Aromas of sweet white flowers. Medium body and acidity with flavours of pear. Pale lemon colour. Aromas of tropical fruits, manago and citrus. On the palate flavours of grapefruit and fermented pear. Pale pink colour. Aromas of strawberries and cream which followed through on the palate. Medium ruby colour. Aromas of red and black currants, fresh and candied blackberries. On the palate medium acidity with medium fine grained tannins. Flavours of blackberries and black pepper. Medium finish. Medium purple colour. Aromas of baking and Christmas spices, cooked and fresh blackberries. On the palate medium acid and medium fine grained tannins. Flavours of vanilla, soft blackberry candy, blackcurrant leaf and as the wine opened in the glass flavours of sour red cherries developed. Grover Vineyards, Art Collection, Rosé (Shiraz) 2011 Je suis Français. Ou je peus acheter ce vin! merci de votre réponse.